Friday, August 10, 2018, 9:00 a.m.
Summary: Thursday, crews patrolled the northern, eastern, and western containment lines. Firefighters improved handlines and continued mopping an active spot in the North Fork of Lockwood Creek, with the help of helicopter bucket water drops. Construction continued on the contingency line just south of Camp Creek. Fire activity increased north of Fall Creek in the late afternoon, and heavy helicopters worked to check the fire’s progression south. Dry fuels and very low humidity kept fire behavior active late into the evening. Today, with forecasted extreme heat conditions and increased winds, firefighters will be closely watching the southwestern edge and will endeavor to keep the fire within the constructed containment lines. The contingency line south of Camp Creek will be improved and expanded and crews will continue the structure protection assessments in the Hillman Basin area. 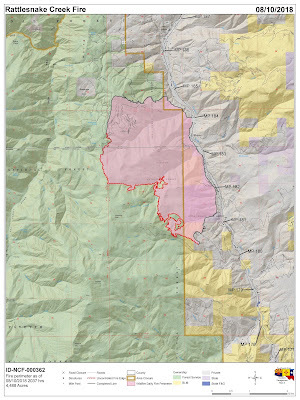 “Fire activity has been minimal, but there is still a lot of open line to the south and west. With the extreme conditions we will be faced with today, there is potential to see a significant increase in fire activity,” stated Incident Commander Alan Sinclair. Resources Threatened: Private property and structures in the Pollock, Pinehurst, Hillman Basin, and Whitewater Wilderness Ranch Estates areas remain threatened, as well as threats to state and federal infrastructure (Highway 95) and natural resources. 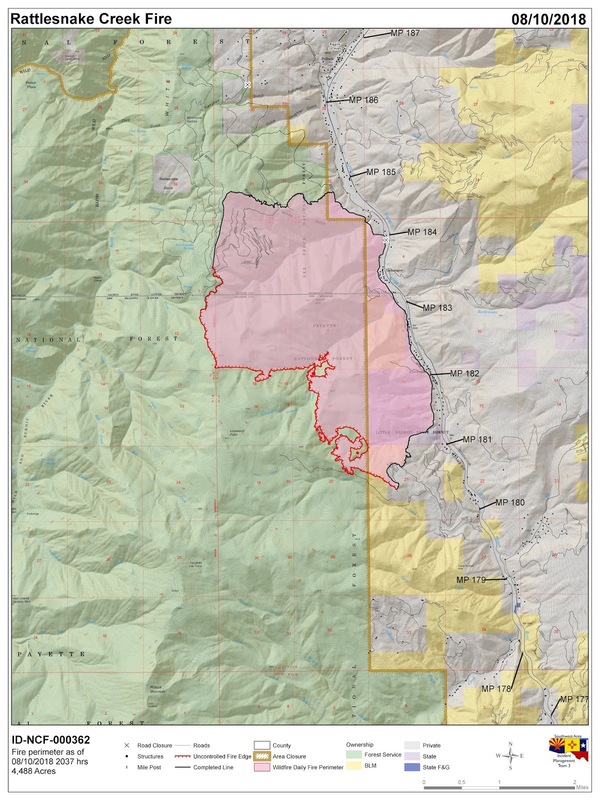 Evacuations/Closures: Residents in the North Pollock, Whitewater Wilderness Ranch Estates, and Pinehurst areas remain in pre-evacuation status (“Be Set”). Some road and area closures remain in effect to provide for public safety. Residents in the general vicinity should remain vigilant and refer to the Sheriff’s Office Facebook pages for any status updates. Both Idaho and Adams counties use AlertSense for emergency alerts. In Idaho County, call the Sheriff’s Department @ 208-983-1100 to enroll; in Adams County, visit https://bit.ly/2AU0C5R to sign up. Additionally, the Nez Perce-Clearwater and Payette National Forests have area closures in effect, including portions of the Hells Canyon National Recreation Area (NRA); see https://bit.ly/2ATSand or the closures tab on Inciweb for more details. Please observe posted speed limits along Hwy 95 adjacent to the fire and be aware of active fire traffic. Temporary Flight Restrictions: Temporary flight restrictions (TFR) are in effect around the entire fire area. Remember, that temporary flight restrictions also apply to unmanned aircraft systems (drones), so if you fly, we can’t! Announcements: Stage 1 Fire Restrictions are have been implemented, use the following link for specific restriction information https://bit.ly/2ag2SUy . For public and firefighter safety, please adhere to all safety signage and speed reductions. Do not stop along the highway corridor near the fire. For road conditions and closures http://511.idaho.gov/.